The political and military environment in Afghanistan remains extremely challenging. While recent international attention has been drawn to the rise of the ‘Islamic State’ group in Iraq and Syria and by the Greek financial crisis, profound tensions continue to haunt both Afghanistan’s state-building endeavor and its security environment. Those two areas of difficulty intersect with each other; insecurity blights the efforts of the National Unity Government in Afghanistan to build its legitimacy, while the manifest difficulties in making the National Unity Government work effectively encourage its opponents (both in Afghanistan and the wider region) to redouble their efforts to weaken or even overthrow it. This is one reason why there have been renewed calls on the United States to halt or slow down the process of the withdrawal of American troops. The National Unity Government, headed at its apex by Dr Ashraf Ghani as President and Dr Abdullah Abdullah as Chief Executive Officer, has struggled to cope with many pressures that it faces both internally and externally with the wind-down of international support. Some nine months after the president was sworn in, the country still lacks a defence minister, with the latest nominee—Masoom Stanekzai—rejected by the lower house (Wolesi Jirga) of the Afghan parliament. Given the scale of insurgency on Afghan soil, the inability to put a defence minister in place constitutes an astounding systemic failure. Furthermore, while Dr Ghani is rightly lauded for his dynamism and imagination, in a system like Afghanistan’s, this cuts both ways: the president is so well known for having strong views on nearly everything that lower-level officials are likely to tremble at the thought of trying to implement policy without precise guidance on how the president wants things to be done. This is a recipe for paralysis in government despite the energy at the very top. This is compounded by a deteriorating military situation. Recent months have witnessed a number of major bombings in Kabul, including one that shook the plaster from the ceiling of the Wolesi Jirga chamber. But it’s developments affecting areas outside Kabul that are more alarming. The northern town of Kunduz has experienced sustained Taliban attack. The police chief of Uruzgan, earlier hailed as ‘our man’ by a senior Australian general, was recently assassinated in murky circumstances during a visit to the Afghan capital. In Jalrez, a district quite close to Kabul, Hazara members of the Afghan Local Police were systematically picked off at checkpoints and decapitated while those who should have been supporting them dithered over how to respond. In addition, armed individuals professing loyalty to ‘Islamic State’ have begun to surface in different parts of the country. While they have ironically struck on occasion at the Taliban, it is the Shi’ite Hazaras who have by far the most to fear from extremist Sunni Muslims of this kind. This has led some external actors, including the United States, to put their faith in negotiations with the Taliban as a means of stabilising the country. While discussions have taken place, most recently in Islamabad, it remains unclear what real capacity the Taliban participants have to bind the various radical groups which have sought to undermine the Afghan government. Many Afghans remain deeply skeptical of negotiations. They doubt that the Inter-Services Intelligence Directorate of the Pakistan Armed Forces (ISI) has abandoned its decades-long promotion of radicals in Afghanistan as a device for minimising Indian influence—even if some civilian politicians in Pakistan now realise the dangers to their own society of seeking to make use of such forces. The spectacle of negotiations also undermines other Afghan government objectives: why would soldiers want to die fighting the Taliban today if a deal might be done with the Taliban tomorrow. Why would a local leader strongly support the government if negotiations might hand his problems or district over to the armed opposition as part of the Taliban sphere of influence? The greatest danger in Afghanistan isn’t that the armed opposition will grind their way, village by village, town by town, to eventual control of the country. On the contrary, it lies in the psychology of those many Afghans who have no affection whatever for the Taliban but realise that it doesn’t pay to be a loser in Afghan fights. Such people, if it appears that the Taliban will come out on top, have a strong incentive to realign on prudential grounds. This can create a ‘bandwagon’ or ‘cascade’ of the kind that led to the collapse of the communist regime in April 1992 and the Taliban regime in November 2001. Western powers can best help prevent this by signaling a commitment to ongoing military and material support for the many Afghans who want to be part of the modern world and who, perhaps unwisely, believed Western promises not to abandon them yet again. William Maley is Professor of Diplomacy, Asia Pacific College of Diplomacy, Australian National University. He has published widely on Afghanistan, and is co-editor of Reconstructing Afghanistan: Civil-Military Experiences in Comparative Perspective (London: Routledge, 2015) and Australia and Canada in Afghanistan: Perspectives on a Mission (Toronto: Dundurn Press, 2015). 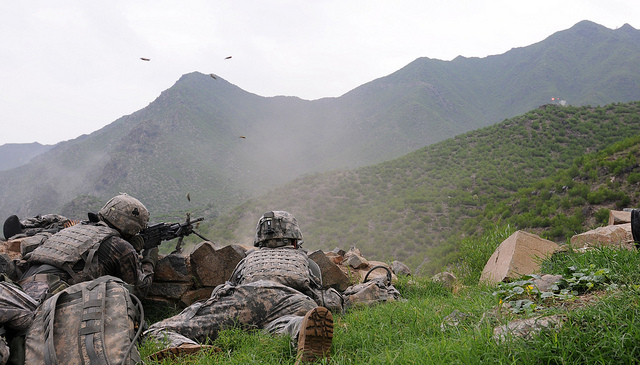 Image courtesy of Flickr user DVIDSHUB.